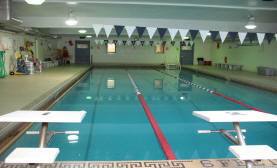 The Dalton CRA is home to the only public access pool in the town of Dalton. From Lap swimming and Family swims to swim lessons and Water Aerobics the pool is an essential part of our community. See the rate sheet to find rates and option for all participants of our pool. Parent Toddler is a passive unstructured and friendly environment encouraging the interaction between other parents and children and future swim instructors. Children learn safety, bubble blowing, and arm and leg movements. This class is for beginners with little or no experience in the water. Children will work on water adjustment and basic skills including blowing bubbles, front and back floats, putting their faces in the water, jumping in, turtle dives and swimming the length of the pool. Child must have general membership. This class is for beginners who have little or no experience in the water. Children will work on putting their faces in, front and back floats, rhythmic breathing, and swimming on their fronts and backs with a flotation device such as a noodle or kickboard. This class is for beginners who are comfortable in the water and deep end with no flotation device. The children will review the skills from the shallow end beginner’s class and be introduced to front crawl, back crawl and rhythmic breathing. The children will work on strengthening their front crawl, back crawl and completely submerging their heads. They will be introduced to diving, while kneeling, rotary breathing, and elementary backstroke kick. This class is for those who want to continue learning the basic strokes. The children will strengthen upon rotary breathing, front crawl and back crawl. They will be introduced to the elementary backstroke, breaststroke kick, side stroke kick, turning on the wall and standing front dives. This class is for those children who are up for a challenge. Child will be able to swim 50 yards of front crawl and back crawl. They will learn the butterfly kick, side stroke, open turns, standing dives from the board, long shallow dives and stride jumps. This class is for serious swimmers. Child will work up to swimming 100 yards of front crawl and back crawl, 25 yards of sidestroke and breaststroke, and 10 yards of butterfly. They will also be able to demonstrate appropriate turns for each stroke and tread water for 3 minutes. Please note: Every child must have a CRA general membership to participate in swim lessons. This class is for beginners who have little or no experience in the water. Please note that no membership is required. Use of the water takes the stress off the joints while improving strength and range of motion where you need it most. The exercises prescribed by your Physical Therapist can be done independently in our pool without the worry of lap swimmers passing you by. Splashercise: Theresa Ott brings you 30 minutes of a choreographed workout in the water and 30 minutes of muscle strengthening. Water Works: Teresa Ott brings you a full hour of choreographed water aerobics. So fun you’ll forget it’s exercise! The schedule will indicate what time the pool is available for lap swim and family swim. Children must be 14 years of age to participate in adult lap or family swim. The schedule will indicate what time the pool is available for lap swim and family swim. Children must be 14 years of age to participate in adult lap or family swim without a parent/guardian. The Dalton Otters Swim Team is a competitive age-group swim team that compete in the north country swim league. This league has teams from Massachusetts and New York State. Practices will begin October 15th and the season will run until early March. Ours swimmers range in the age of 5 years to 18 years of age. General skills for new members are: Basic knowledge of freestyle with breathing to the side and backstroke. Ability to swim more than one length without stopping. Desire to learn and commit to the sport of swimming. Anyone interested is encouraged to come to scheduled tryouts so that we can evaluate the swimmers ability level. (new swimmers only). For more up to date information, check out The Dalton Otters website – http://www.daltonotters.org.